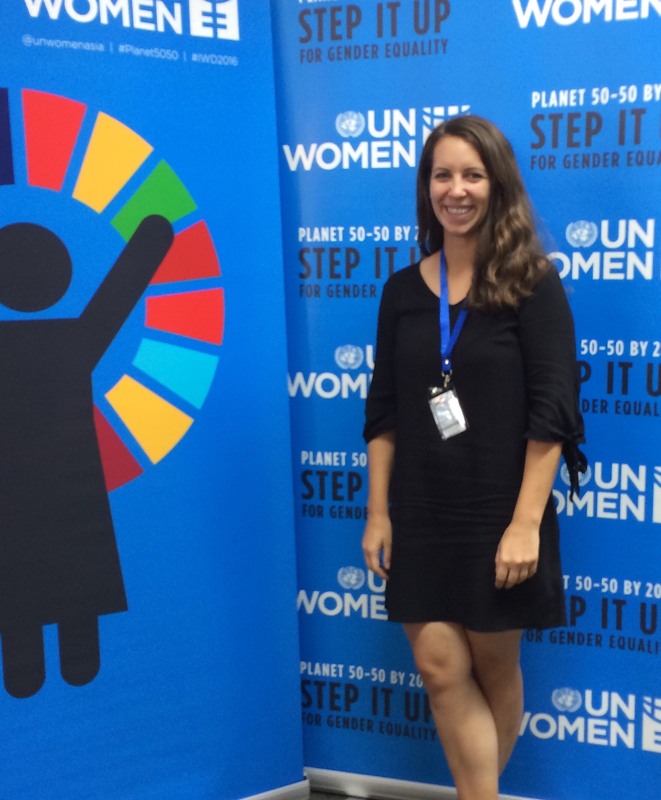 I am a second year IPD student at MIIS currently wrapping up a six-month DPMI+ Fellowship in Bangkok, Thailand with the UN Women Independent Evaluation Service (IES) at their Regional Office for Asia and the Pacific. I served the Regional Evaluation Specialist Sabrina Evangelista as a Freeman Foundation Fellow to East Asia supporting Program Evaluation. How did you find UN Women? Why were you interested in working with them? 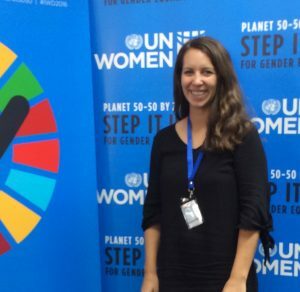 UN Women has always been on my radar as an organization I wanted to understand better from the inside to determine if it would be a fit for me. The posting for this position was shared by a member of the MIIS CACS team and further endorsed by two recent MIIS alums who also did DPMI+ placements with UN Women before being hired on as full-time consultants. Why did you choose to go abroad for your internship, rather than stay within the US? Unlike many of my peers at MIIS, I haven’t spent years living and working within the development context from a remote village or bustling urban center at all ends of the earth. While my work was international in nature, I was often bound to a desk wishing I had more primary experiences in the geographies I was focused on and with the communities I wanted to serve. Leveraging various immersive learning opportunities at MIIS to conduct research and engage in learning abroad has been a very important part of my graduate school journey. What courses at the Middlebury Institute helped prepare you the most for your current position? The Women and War workshop offered by Dr. Iyer was one of the most personally meaningful classes I’ve taken so far at MIIS. It was my impression that my colleagues liked it as well, to varying degrees, but that we universally appreciated and valued the difficult conversations that it sparked between us, exposing the rare and beautiful gray space that exists amidst the head-nodding that can overtake an environment with so many like-minded students. A regret, perhaps, is that the male perspective was largely absent from these incredible debates and discussions, as gender and power relations are at the core of almost all development work (ahem, fellas, register for this class!). In a very practical sense, I also gained invaluable exposure to tools and theories that I used every day at UN Women from the Program Evaluation Sprintensive Module offered by Dr. Levinger. What projects did you work on? How did they relate to your personal mission? I had the sincere pleasure of working for a supervisor that blessed me with a blend of guidance and autonomy throughout my time on assignment. I was empowered to make meaningful contributions to a regional evaluation assessing UN Women’s organizational architecture as well as in drafting the 2019-2021 Regional Evaluation Strategy for Asia and the Pacific. Both of these bodies of work provided me with a wide lens to better understand the complex nature of the global development system and how to work towards achieving results within a decentralized context. Regardless of where you’re coming from professionally when you arrive at MIIS or your DPMI+ Fellowship, it is extremely likely that your skills will translate. You absolutely don’t need to have lived in a remote village for years to make meaningful contributions to class discussions or a development organization as a DPMI+ Fellow. In fact, I found that having spent several years operating outside of the development space in the private sector was an asset, allowing me to share a different perspective and offer a complementary skillset to peers who shared very similar backgrounds to each other. 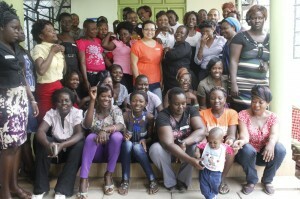 What are your plans now that you have completed your time at UN Women? After slowly and methodically proofreading my final DPMI+ deliverables before I submit them, I will fly home for a few weeks before returning to Monterey to complete my last semester at MIIS. Would you recommend DPMI+ to other MIIS students? The DPMI experience allows for an incredible array of opportunities and comes with an amazing network of alumni around the world doing great work. 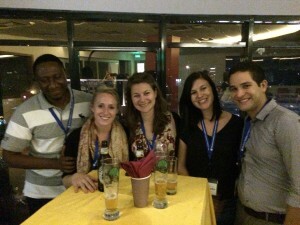 I would absolutely recommend building on the DPMI experience through a DPMI+ Fellowship abroad. I would specifically recommend reaching out to UN Women in Bangkok if you are interested in Program Evaluation! If you would like to know more about DPMI+, please email dpmiplus@middlebury.edu or visit here. Hi, I’m Chndy Rogel. I am an international student from the Philippines who moved to California to pursue a Master’s degree in International Policy and Development, with a specialization in Monitoring, Evaluation, and Design. I recently graduated and completed my DPMI+ assignment in Washington, DC as an intern for the Research and Evaluation Department of the Global Education, Employment, and Engagement Unit of FHI 360. While at FHI 360, I programmed mobile data collection tools, conducted data cleaning, and performed qualitative and quantitative analysis for global education projects in West Africa and Central America. How did you find FHI 360? Why were you interested in working with them? When I was fresh out of college in the Philippines, I’ve wanted to apply for positions at FHI 360. However, the programs in the Philippines were primarily in health and I do not have any background in health projects. While searching for internships towards the end of my third semester at MIIS, my career advisor reminded me of FHI 360. I went to their careers page and found a research internship with the Research and Evaluation Department of the Global Education, Employment, and Engagement Unit. I was drawn to working with them because of the variety of sectors they work in and their expertise in monitoring and evaluation. 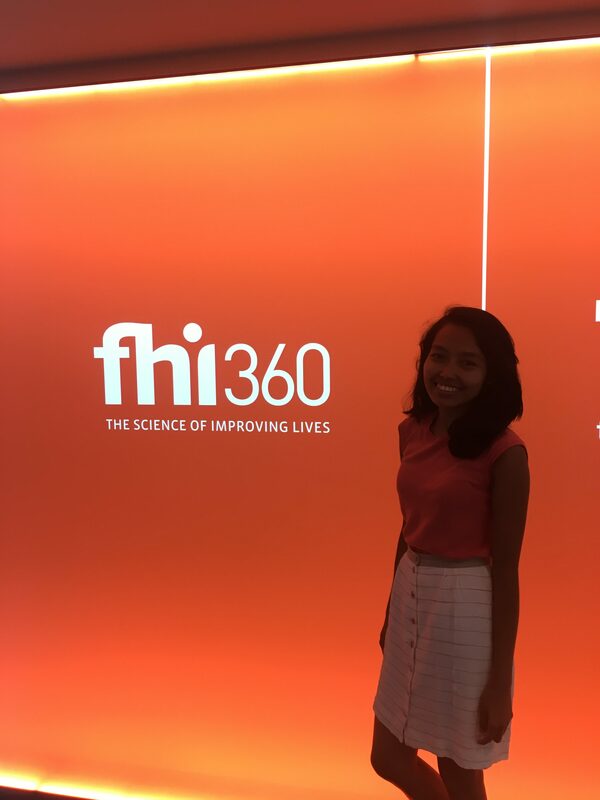 I have limited experience with education projects and I wanted to get exposure to global education through the internship at FHI 360. The courses that prepared me the most are Introduction to Policy and Data Analysis, Qualitative Data Analysis, Program Evaluation, and DPMI. What has been an unexpected challenge you have faced while at FHI 360? My most important takeaway is committing to finishing what I have started. It was a big challenge for me during my final three weeks because most of the tasks that I was anticipating early in my internship came later than expected. I found myself working long hours to finish everything by May 18th. I felt excited that I was trusted with so much work but also found myself getting more exhausted than usual at the end of the day. I realized (and one of my senior colleagues also noted) that it is not sustainable. I almost gave up but realized that I just needed to take more breaks and limit my work hours on weekends. Work-life balance has been a challenge for me and my colleagues have been reminding me about it. 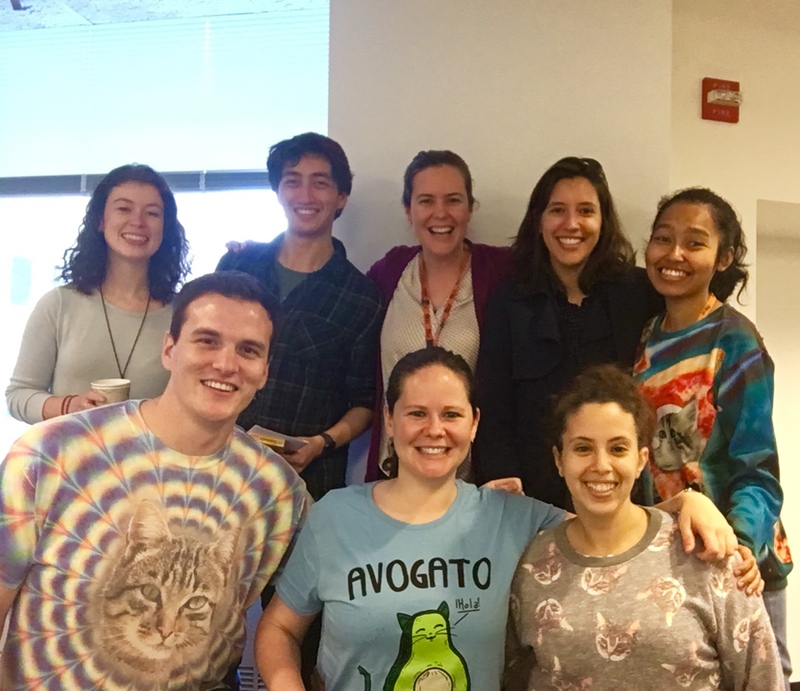 The best part about working with the Research and Evaluation Department is having a supportive group of colleagues who are eager to share what they know and would also listen to what you would like to get out of the internship. They also acknowledge the strengths and interests of the members of the team. I was asked to extend my internship, to which I agreed, but had to take a break for two weeks while I wait for work authorization for my post-completion Optional Practical Training (OPT). International students cannot work after graduation until we have received our one-year OPT. I am continuing my internship until August. My priority projects are on fidelity of implementation of early grade reading programs in Ghana and Nigeria and on professional learning communities for teachers in Ghana, Nigeria, and Equatorial Guinea. I was also invited to support the work on mapping student disability screening tools for primary school-age children. One of my learning objectives for pursuing an internship at FHI 360 is to learn about their monitoring and evaluation approaches to development projects and the research initiatives they pursue. My personal mission is to find ways to create equal access to opportunities to improve the quality of life of individuals and to support them in becoming economically active citizens. Improving the education system in developing countries, such as the Philippines, is one way of supporting individuals in reaching their full potential to become productive citizens contributing to the country’s development. Personally, I have to be better on work-life balance. Even when you enjoy what you are doing, there is a limit to what your brain and body can take. In terms of professional skills, I learned mobile data collection tool programming, which I realized is something that seems to be in demand for the positions that I have been applying for. I also had the chance to observe and participate in the development of an Activity Monitoring, Evaluation, and Learning Plan (AMELP) for USAID during proposal development. What are your plans now that you have completed your time at FHI 360? I am currently looking for positions in international development, primarily on research, monitoring, and evaluation. DC is a great place to find headquarters experience on international development. I’m primarily interested in projects on micro, small, and medium enterprise development and livelihoods. The networking skills that I have learned at MIIS have been very useful in reaching out to professionals in this field for career advice and informational interviews. 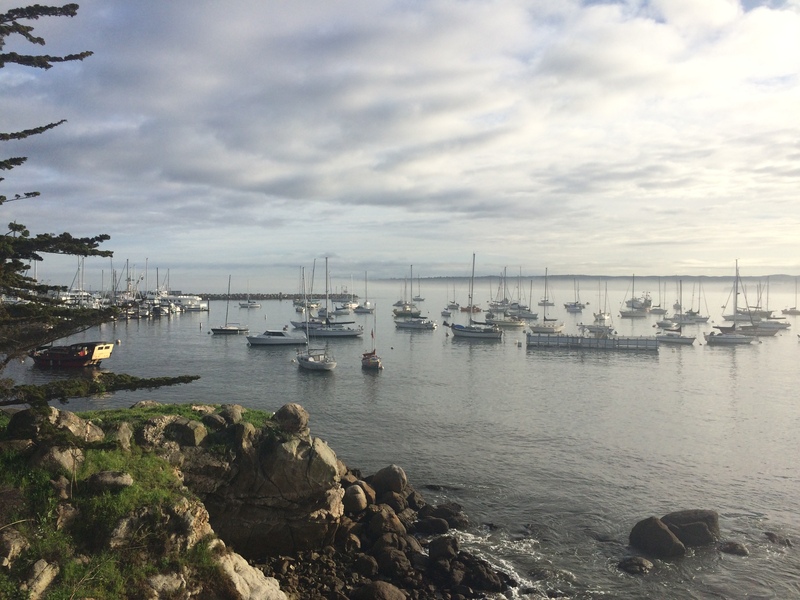 Already fantasizing about the incredible summer internship you’re going to land? Good! You should be. If not, I’m here to plant the seed. The truth is, summer seems like a grueling academic year away, but it’s lurking just around the corner. Without a swipe left, swipe right graduate internship app option, identifying interesting organizations and cruising MIIS resources now will prevent you from giving the “OMG OMG OMG” crazy eyes to your advisors this May. 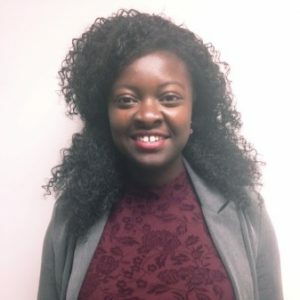 I sat down with Donna York (IPD ’18 – goldmine of good advice) to reflect on her time Interning for the Climate Change and Disaster Risk Reduction branch of the United Nations Development Program (UNDP) in Geneva. Be that annoying person who sees your advisor all the time. Planning is super important. I met with my advisor Scott Webb almost once a week to ask questions and get reassurance that I was doing everything right (Scott is good at the reassurance part). Perfect the basics. Get your resume and cover letter absolutely perfect in the fall so you are set to send them out. Organizations like the UN see having mistake-free materials as just checking the first box. Apply. Apply. Apply. I started sending things out early and applied for 30 internships across the UN and over a dozen more at organizations that interested me in Washington D.C. If I could, I would have applied for even more. Get financial support. I have applied for and received MIIS Immersive Professional Learning (IPL) funding twice. The process to apply was simple and the deliverables I was required to submit for receiving it were flexible. Be that annoying person (again) that e-mails all the time. 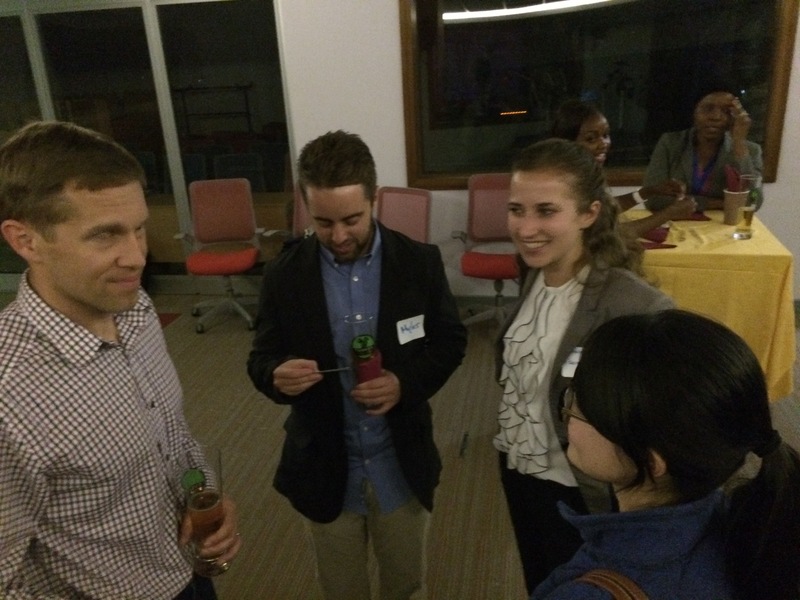 Once you’ve landed the internship, build your network. You have nothing to lose in making connections. Even if you don’t have a specific ask for that person in the moment, you never know when they might pop into your life again in the future. Seriously, always follow up after an information session, coffee, or even if someone gives you their card. For more application inspiration, explore MIIS Immersive Learning Programs and keep an eye on Zócalo for hot leads. You can also check out more MIIS immersive learning examples from all over the world at the Immersive Learning Project Portal. Immersive Learning Student Portal is Live! Read about students’ immersive learning projects all around the world including in the United States from 2014-2017. Click here to visit the student portal. The student portal is a compilation of immersive learning experiences of MIIS students along with their project deliverables. Immersive learning is the learning that occurs when students are outside of the traditional role of teacher and student. Immersive learning is collaborating with other people, organizations, and governments. It is the critical process of applying critical thinking and is a cornerstone of the Middlebury Institute of International Studies (MIIS) pedagogical philosophy on helping students develop skills and knowledge for preparing students to build a better world. Immersive Learning Programs include internships, DPMI +, IPSS, J-term & Spring Practica, summer opportunities, and directed studies. Through immersive learning programs, students take part in projects where they are outside of the traditional role of teacher and student. MIIS and California State University at Monterey Bay (CSUMB) have been collaborating on a project called Community Action Hubs. 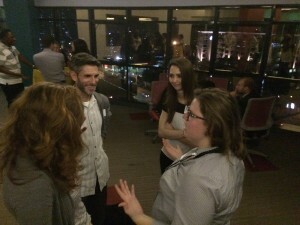 The underlying question being explored is: How might we have more meaningful, long-term engagements with community organizations that we partner with? This includes student, faculty and staff projects, practica and research. In an effort to collect and share historical data, Immersive Learning has been capturing a range of information on collaborative learning with the local community and surrounding areas. Whether you have a research focus in mind or want some inspiration from past work, check out the database! 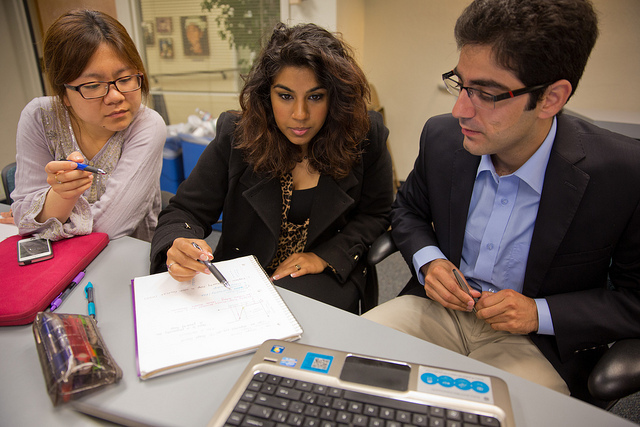 Experiential learning is a cornerstone of the MIIS experience. While you are here, you are able to participate in a wide range of international and domestic immersive learning opportunities during the January term and spring break. Practica provide students with opportunities to explore real world contexts as freelance consultants, field researchers, and junior-level professionals. Immersive Learning recently announced 2017 Practica and now invite you to an informational session to discuss the variety of opportunities available. Where can you picture yourself —Colombia, Czech Republic, East Asia, Egypt, Nepal, Peru, Rwanda, Spain or here in California? For complete details on 2017 opportunities visit http://go.miis.edu/practica. 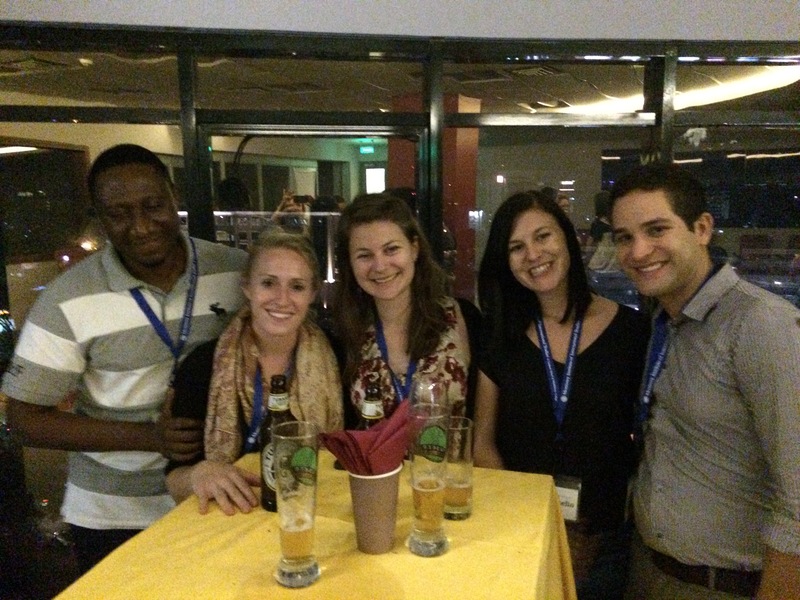 2015 is the inaugural year for the Middlebury Institute’s newest opportunity for professional and academic advancement, the Summer Peacebuilding Program (SPP). It is set to begin July 27 with a total number of 17 participants. The first cohort represents a varied background, from activists to students and entrepreneurs. The program is set to run for three weeks and focus on bridging theory and practice regarding effective methodologies for facilitating peace in zones of conflict. Offered through the Center of Conflict Studies, SPP offers a fantastic opportunity to work with specialists and practitioners who have dedicated time to resolving some of world’s most pressing security issues. In its inaugural year, SPP participants will have the opportunity to utilize their newly found knowledge within the local community in Watsonville, CA. For more information, please visit the Summer Peacebuilding Program website. 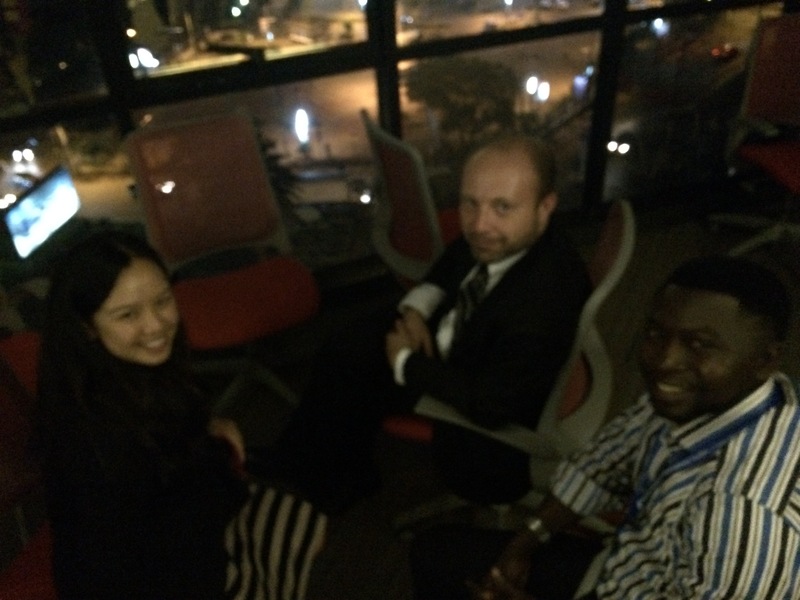 A June 9th reception in Nairobi drew over 25 members from the entire Middlebury community including alumni from Middlebury College, the Middlebury Institute of International Studies at Monterey (MIIS), the MIIS Frontier Market Scouts fellowship, and the MIIS Program on Design, Partnering, Management and Innovation (DPMI). 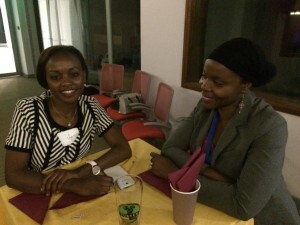 The event was held at the Aga Khan Graduate School of Media and Communications in the 9 West building in the Westlands neighborhood of Nairobi, the site of the June 2-11 DPMI Kenya training. The group welcomed the wonderfully diverse group of DPMI Kenya trainees to the alumni community. DPMI Kenya participants in the June training hail from over seven different countries (Kenya, Nigeria, Niger, Venezuela, the Philippines, South Africa, and the US). 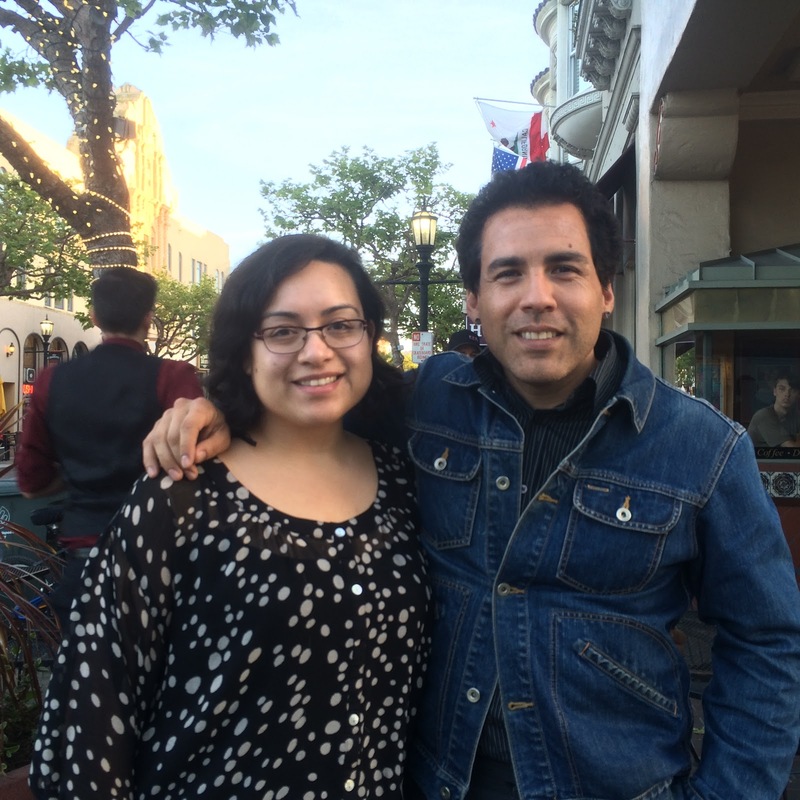 I sat down with Maritza Munzón (MPA/IEM ’15), and Rafael Hernandez (MPA ’15) at a local coffee shop last week to interview them about MIIS’s Immersive Learning Programs. Maritza has traveled on five trips to six countries through MIIS (Peru, Cuba, Kenya, Mindanao, and East Asia), and Rafael has gone to four (Peru, Cuba, Rwanda, and East Asia). Both had a lot to say, much more than I can fit into this interview; I can’t encourage you enough to talk with your peers about their experiences abroad. Q: What made you choose the immersive learning programs you chose? Maritza: For me it’s always about “why not?” It is always a question of “if I don’t go, will I regret it?” And the answer is almost always “Yes”. So I do everything I can to take advantage of the opportunity to travel. Furthermore, because I am in the IEM degree program and want to conduct these trips myself one day, the best way to learn how to do this is to go on as many as I can! Rafael: I was eager to begin traveling right away when I got here. That was the reason I picked this school over many other options – the traveling component. Right off the bat I could go on this Peru trip, that had a practical application of policy analysis, – and so I went. M: I don’t think many people have traveled the way we travel here at MIIS. There is only so much reading you can do about culture, practice, and so on, but you need to embed it in your muscle memory to learn and understand. Q: Have you gone on any trips together? Both went to Peru (but in different communities), as well as Cuba, and East Asia. M: Peru started my obsession with these trips; the experience got my feet wet and then I wasn’t scared, anymore, to do the others. Q: Are there any programs you especially wish you could have gone on? R: I would have liked to go to the Philippines. M: I would have done the El Salvador trip if I had the time. But I am always torn between what is familiar and what is less accessible. El Salvador is within my reach because of language, so I decided to take the leap and go on trips that I was less likely to do on my own: Kenya, East Asia, and the Philippines. Q: How did the programs and learning styles compare? Both: Cuba was more like learning tourism, while Peru and East Asia where more research based: we did academic research in Asia, and field research in Peru. M: I was a guinea pig for many of the trips – for example: Kenya, Peru, and East Asia. Cuba was established. Being on a program in its first incarnation is a valuable experience for someone learning about how these programs are conducted. R: I learned a lot about different types of intelligence and understanding. You know there is the computer competency type, where you either know it or you don’t. And if you don’t, you can ask help from someone who does – and there are no ego problems associated with that. Cultural competency, on the other hand, and especially at this school, is more complicated in that way. Then there is emotional intelligence (EQ) versus the IQ. When you go to speak to someone in a village, everyone on these trips is so concerned about being politically correct, which makes them all self-conscious. I found that the best way to take to people is honestly and openly. Q: Since you have gone on so many of these programs, do you have any constructive feedback? R: Like I said, these trips are one of the reasons why I chose this school. And we are so grateful for these experiences. M: Growing up the way I did, I would have never been able to do this on my own. And I am grateful, and the best way I can give back is by applying my IEM knowledge and skills and giving constructive feedback. I was able to design a pre-departure training for the Peru trip, which was very well received, but not yet implemented. 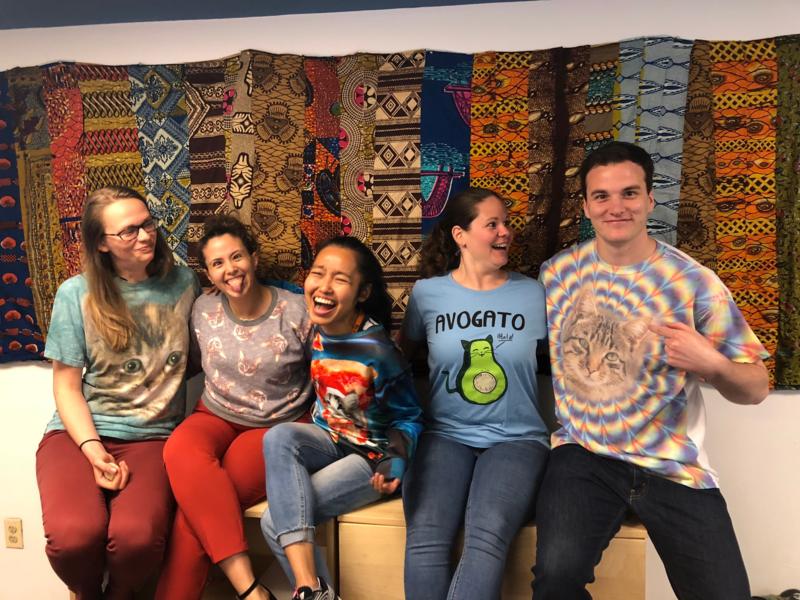 Based on our experience in Peru, Cortney Copeland and I designed a pre-departure workshop and assessment for that trip through our IEM Design and Assessment Class. In the workshop we wanted students to bond with the people in their groups, learn each other’s working styles and strength, while also getting to practice giving the surveys and entering the data. There are always hiccups with international travel and our goal was to develop cohesive groups before departure to help student better work through some of those unpredictable moments. The assessment consisted of a simple survey that students took before and after the trip to better inform staff and faculty of what is working and what needs improvement. One of my frustrations with the organization of these trips is that the system that puts these trips together does not value the experience that the students going already have. Because the information isn’t coming from a respected magazine or periodical, but from the mouth of a student, who has had the personal experience or cultural experience growing up – but they didn’t write a paper on it, so…. We don’t get a diploma for growing up bilingual or for living similar lives to that of the people we are studying. R: So if professors and institutions have a way, for better or worse, of validating those experiences, for example, “here is Maritza, she grew up in a culture that…..” and by doing that, it validates the person, and symbolically validates the peers that have experienced this. People come back like “I was shocked to see this and that”, and that is the only thing that gets the spotlight. But there are people who have lived this their whole lives. M: Out of the bad comes the good. MIIS is proud of its international diversity on campus, but now there are also conversation on national diversity and socioeconomic diversity as well, which is something that came out of a critique on one of these trips. We go on these trips, and learn, and some things are difficult, but the important thing is to take the bad with the good and make something out of it. For some of us, that meant creating the Diversity and Inclusion Committee, which highlights domestic diversity on campus and is working on assessing the needs of all students, whether international students, first generation college students, student of color, LGBTQ, or second career seekers. We not only wanted to address diversity by identifying the needs of all students on campus but to make sure it is something that continues to be addressed in the institution after we are gone. Professors should also make a point to make focus groups mandatory. A format of how to measure the trips as a whole, but also each trip individually, so it can be improved upon, but that responsibility also shouldn’t sit solely on the professor’s shoulders. Q: Any advice for students who will travel on these programs in the future? M: – and so on because it distracts from the experience. Don’t fight the discomfort. R: You don’t need language to communicate with people. You shouldn’t necessarily know a language perfectly – keep the willingness to go at the forefront. Don’t be catered to: we chose to go, to help. Be the one helping, not the helped. Own your decision to go. Language should not be a barrier to communicating with people. In fact, I learned from my inability to speak the local language, which became a resource of information, connection, and interaction. When I ask you, “how do you say this?”, I become your student and switch the power dynamic. People love to teach you, to speak from authority. There is laughter, and it breaks the ice and opens new things. They think, “Here is a person who wants to know my language.” It helps equalizing the playing field. Q: Is there something you never travel without? M: I carry medicine for altitude sickness, headache, nausea, diarrhea, congestion, and allergies; but I also carry hydration salts and EmergenC to try and prevent getting sick as well. You never know how sick you are going to get and might not be able to get to a pharmacy right away or be able to communicate what you need so its good to carry some meds you trust. Oh! and Baby wipes. R: Baby wipes! Pen and notepad. M: That’s what I picked up, now I’ll do that. M: Learn how to say a greeting, and please and thank you in the local language. 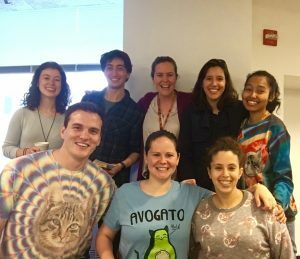 Katya Gamolsky (joint BA/MA ‘17) is a first year student who works for the Immersive Learning Programs Office. She recently went on the Los Angeles trip that focused on Homelessness, with Dr Iyer, and will be attending DPMI DC this summer. If you have any questions, comments, or would like to know more about our Immersive Learning Programs, please email her at immersive@miis.edu. In January several students applied for this grant but none were awarded. In every case the requests were for the summer because there was little time for anyone to prepare a travel grant proposal for the spring immersive learning programs. The result is that all the money available for travel grants is now available for summer and fall travel for research on social change in Africa. The research must be conducted in Africa for a duration of at least 2 and a half months. To receive this grant students must submit a research design that focuses on a social condition in Africa of the applicant’s choosing; e.g., poverty, environment, crime, armed violence, gender inequality, conflict, disease, education, refugees, etc., with the goal of making policy/program recommendations that can change that condition. Location of research, to include a letter of support from an organization which is hosting or assisting you with your project. A two page statement that includes a complete research design, to include a research question, a literature review that shows a need for this research, evidence generation methods, and its potential impact on the social condition. A description of the deliverable and date of completion. Applications must be received between now and 1 April. A committee of faculty judges will evaluate all applications and determine the recipients of the award by 15 April. Awards will be given as reimbursement for travel to Africa. Only enrolled students may receive a travel grant. If two students will be conducting the research together, the award will be split between the two students with a cap of $1500 per award. Travel will not be awarded for an internship, unless appropriate research will be conducted as part of the internship. If you have any questions or wish to discuss the eligibility of your planned research for this award, please make an appointment with Professor Ed Laurance at elaurance@miis.edu. He can also be reached at 831-402-2631. 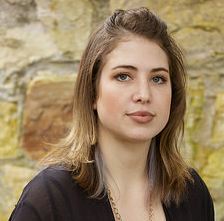 These awards are made possible by a continuing donation from the family of Sarah Meek, a MIIS alum of 1996 whose life was cut short while working to improve social conditions in Africa. 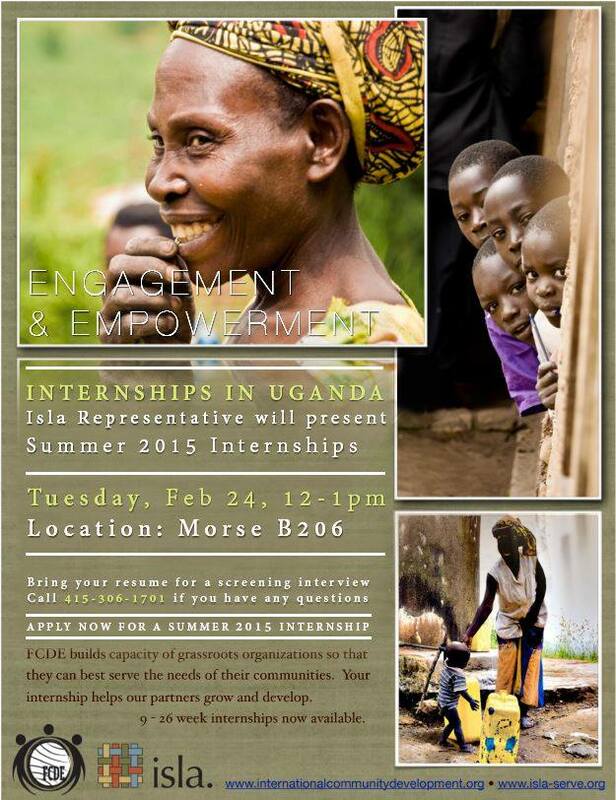 New Internship Opportunity in Uganda! *MPAs – this could count for DPMI Plus! http://www.globalmajority.org/, and more info here. Cultural Vistas is accepting applications for the Summer Internship Program in Spain and the Internship Programs in Argentina and Chile. The application deadline for all three programs will be January 15, 2015. This program provides an opportunity for U.S. and Canadian students to gain international work experience, improve Spanish language skills, and experience Spanish culture firsthand. Participants complete unpaid three-month internships in companies across Spain. Internship placements are available in a variety of fields, including, but not limited to business, economics, engineering, finance, Spanish studies, international relations, IT, media/communications, non-profit sector and tourism. This program provides unpaid internship opportunities for U.S. and Canadian students and young professionals in either Buenos Aires or Córdoba, Argentina. Two program options are available: a 4-week Spanish language course and an 8-week internship with an Argentinean company (Combination Language/Internship Option) or a 12-week internship with a host company (Internship Option). Internship placements are available in a variety of fields, including, but not limited to business, economics, engineering, finance, Spanish studies, international relations, IT, media/communications, non-profit sector and tourism. This program provides unpaid internship opportunities for U.S. and Canadian students and young professionals in Santiago de Chile. Two program options are available: a 4-week Spanish language course and an 8-week internship with a Chilean company (Combination Language/Internship Option) or a 12-week internship with a host company (Internship Option). Internship placements are available in a variety of fields, including, but not limited to business, economics, engineering, finance, Spanish studies, international relations, IT, media/communications, non-profit sector and tourism. 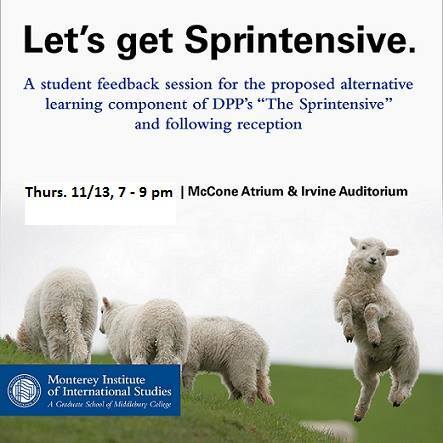 Join us tomorrow evening to learn more about the upcoming change to DPP and the alternative learning semester, Sprintensive! Wine and Pizza reception will follow! 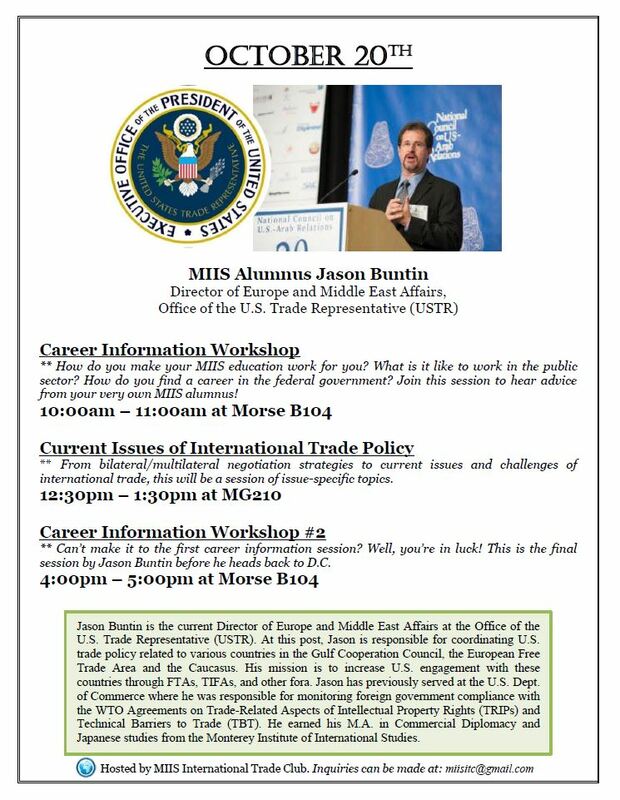 Trade club brings MIIS Alum and Director of Europe and Middle East Affairs of the United States Trade Representative to campus. Spring and Summer Opportunities in Russia! The Graduate Initiative in Russian Studies is pleased to announce that two MIIS and two Middlebury students will participate in a research trip to the Russian Far East under the supervision of Professor Tsuneo Akaha (GSIPM). The trip is designed to introduce the participants to the political and economic issues of contemporary Russia, with a focus on her Far Eastern territories, and relations with the neighboring countries. Students will take part in meetings with faculty, researchers, and students of Far Eastern Federal University in Vladivostok and the Economic Research Institute in Khabarovsk, as well as local community representatives in these two largest cities in the Far East. The students will develop a research report based on their trip and pre-trip and post-trip research. Students who wish to earn academic credit will consult with Prof. Akaha and Prof. Vassilieva. The entire cost of the trip will be covered by the Graduate Initiative in Russian Studies, a MIIS project funded by Carnegie Corporation of New York. Preference will be given to students with advanced Russian language skills. An essay describing the applicant’s background and interest in Russia (including the Far East) and her relations with the regional neighbors, including Korea, Mongolia, China, and Japan. The essay should be three-pages long and submitted by email to Prof. Akaha and Prof. Anna Vassilieva by Friday, November 7, 2014. An up-to-date resume, to be submitted along with the above essay. An oral interview after review of the above submissions. Applicants will be notified of the results of the selection by Friday, November 14, 2014. Inquiries may be addressed to Prof. Akaha at takaha@miis.edu or Prof. Vassilieva at avassili@miis.edu. The Graduate Initiative in Russian Studies is pleased to announce that there are funds available for four MIIS students to undertake an internship and/or research in Russia in the summer of 2015. The entire cost of the trip will be covered by the Graduate Initiative in Russian Studies, a MIIS project funded by Carnegie Corporation of New York. The available funding covers round-trip travel, accommodation allowance, and miscellaneous expenses. Only students with advanced Russian language skills will be considered. An essay in Russian describing the applicant’s background and interest in Russia. The essay should be three-pages long and submitted by email to Prof. Anna Vassilieva by Sunday, March 1, 2015. A detailed research/internship proposal, including desired placement, focus of research/internship, and deliverable. Applicants will be notified of the results of the selection by Sunday, March 15, 2015. Inquiries may be addressed to Prof. Vassilieva at avassili@miis.edu. 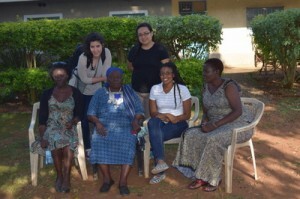 MIIS students meet President Obama’s paternal grandmother in Kenya! Over the summer, students participating in DPMI Kenya had the opportunity to visit President Barack Obama’s paternal grandmother! She lives in the province of Nyanza, on the eastern edge of Lake Victoria. Nyanza is a Bantu word which means “a large mass of water.” The provincial capital is Kisumu, where the DPMI training is centered in partnership with the Omega Foundation. I was in Kenya a total of two months; at the time it felt longer, maybe because it’s a slower pace of life in Kisumu, or maybe because compared to a year at MIIS anything else seems to go at a snail’s pace. Whichever the case, slow was nice and much needed. Now looking back it seems like it all went by in a blur, I can’t believe how much I saw and experienced in two short months, while still having time to cook, read for fun and watch the World Cup every night! The DPMI training was intense of course, but nothing short of what is to be expected from a MIIS workshop, except that it was longer (10 days). This meant 8 hours a day of group work, charting, mapping, learning new tools and immediately applying them. We mostly failed at implementing the tools properly, but a great deal was learned from correcting our mistakes. I can now say that I am no expert at program design, but I know how to tackle the task of designing a program. Our guide/mentor/program liaison, Rose Waringa, is a multitasking superwomen, she did a great job of taking care of us in and out of Kisumu. On the weekends we were taken to explore the local sites, it was great to get out of Kisumu and leave the books behind for a bit. There is LOTS of natural beauty near town and I feel fortunate to have taken a walk through Kakamega Forest, taken a boat ride on the biggest lake in the world (Lake Victoria) and visited President Obama’s paternal grandmother! Never thought I’d get to do any of it, let alone the last part! Last week the Peace Trade and Development (PTD) students met with Tesla’s global trade team at the factory in Fremont. The students were there to offer their pitch to the Tesla Challenge which called for proposals on sourcing raw materials for the new Gigafactory. In addition to the pitch session, the students were treated to lunch and a VIP tour of the Tesla factory, an impressive and re-purposed building conveniently situated in a California Free Trade Zone. “I was treating the presentation like a final exam, but when it came time to present, I had realized that we were speaking to real individuals with genuine concerns about their long-term acquisition of critical minerals. This wasn’t a quiz–my team had done in-depth research, provided a reasonable strategy, and were ready to have a conversation about alternatives.” – Shruti Korada, PTD summer 2014 student What was the best part of the Tesla challenge? Well, that’s subjective but things definitely got intriguing when one team suggested sourcing Lithium from the moon and another proposed a corporate-backed coup d’etat… Learn more about the PTD program via: go.miis.edu/ptd. The AASD is hiring a Student Evaluation Team for J-term 2019!